If your property has been infested with termites, it is important to seek professional help immediately. Of all insects, termites are the most destructive, causing literally billions of dollars in damage to homes and businesses. With the right termite control company, your property will be free of termites. In addition, the company can offer you a preventative plan to keep them at bay. All termite control companies have their own methods for getting rid of termites, but the following are some of the five ways proven most effective. Permethrin Dust – Permethrin dust is a natural termite control insecticide that produces excellent results. Not only is it highly effective for getting rid of termites in commercial spaces, it also eliminates ticks, ants, ground beetles, bagworms, and many other annoying pests. Arsenic Dust – Some termite control companies use this type of dust, which is effective in treating termites that are seen but also those in the colony. As one sprayed termite makes its way back to the colony, other termites are affected. However, any bugs that feed on the dead termites will also be eliminated. Removal of Damp Wood – The more reputable pest control companies do more than just spray chemicals. A company that offers pest control in Toronto will check the commercial space for anything that termites might use as a home, including damp wood. If wood floors, baseboards, or stacked wood is damp, you will need to have it replaced or get rid of it. Temperature Setting – Termites do not thrive in cold environments. Depending on the size of the space or affected area, liquid nitrogen may be used as a spot treatment to bring the temperature down low enough to kill termites. Flooding – Another natural termite control method involves drowning the termites. For example, if termites are outside of your property in a bed of plants, the experts would flood the termites’ mud tubes to literally drown them. 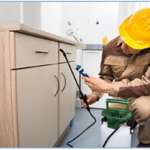 For immediate help in eliminating a termite problem, as well as preventative maintenance, you can always count on the experts at Pestico Canada Inc. We have been providing services to our customers for years, not only for termites but also rodents, raccoons and other pests. Please browse through different services that we offer our website. If preferred, you can call us at 416-747-7378 to schedule an appointment for your business.